CONCORD, NH -- Several active duty and retired members of law enforcement will question presidential candidates on the campaign trail in New Hampshire today and tomorrow about the failed war on drugs they've been asked to waged. 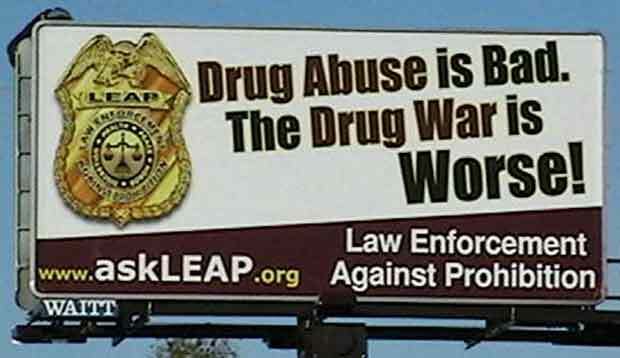 "As an active duty jail superintendent, I've seen how the drug war doesn't do anything to reduce drug abuse but does cause a host of other problems, from prison overcrowding to a violent black market controlled by gangs and cartels," said Richard Van Wickler, the serving corrections superintendent in Cheshire County, NH and a board member of Law Enforcement Against Prohibition (LEAP). "For a long time this issue has been treated like a third rail by politicians, but polls now show that voters overwhelmingly agree that the drug war is a failure and that a new direction is sorely needed." WHERE: 2012 College Convention; Grappone Conference Center; 70 Constitution Ave.; Concord, NH (1:00 PM Thurs discussion panel in Merrimack Room). Gallup has been asking Americans about marijuana legalization for more than 40 years. This October, for the first time ever, the firm found that more Americans support legalizing marijuana than oppose it (50%-46%). The support for legalization is up from 36% five years ago and just 25% in the late nineties. According to Zogby, three out of four Americans believe the overall war on drugs has been a failure. Among the Republican candidates, only Ron Paul has forcefully called for an end to the drug war. Gov. Rick Perry and Gov. Jon Hunstman have said that states should be allowed to legalize medical marijuana without federal interference. Newt Gingrich, when asked by a woman in New Hampshire this week whether she should be arrested for her drug use, said, "No, you shouldn't be arrested for recreational drug use but you also shouldn't do it." President Obama, while opposing legalization, has said that it is "an entirely legitimate topic for debate."